We have all kinds of beds for sale - so wherever you want to lay your head, you'll find a bed set in all styles and all sizes from single to super king. TV beds? Storage beds? We've got them too. 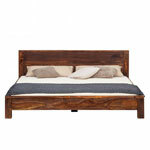 Slated or solid, modern or traditional, our wooden bed are designed to bring warmth to any bedroom. Choose a traditional bed frame or, for a coastal-inspired look, go for a fresh and breezy wooden bed.